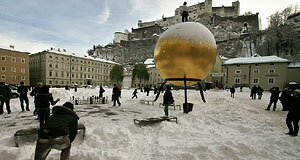 The Kapitelplatz is a square in the Old Town (Altstadt) of Salzburg, situated right next to the Salzburger Dom cathedral and extending towards the Fortress. It is one of the biggest Baroque squares in Salzburg; the Kapitelplatz is well-known for the Kapitelschwemme, a Baroque horse well that is covered in a separate article. There are several buildings situated at the Kapitelplatz, including the current bishop′s palace (Erzbischöfliches Palais) and several administrative buildings of Salzburg University and the Archdiocese of Salzburg. For tourists, there are a few details we would like to point out. The house on Kapitelplatz 1 is the so-called Dompropstei. The building′s current outlay mostly dates back to 1600, when Prince Archbishop Wolf Dietrich von Raitenau re-developed the entire neighbourhood around the cathedral. The building incorporated two previously existing buildings – which you can see in the ground floor, which is lower than in other buildings nearby. The building′s front façade has seven axes, which underlines the importance of it. The Dompropstei served as the headquarter of the cathedral′s "management" and was right next to the Kapitelhaus, the headquarter of the cathedral′s "board of directors". From the Kapitelplatz, you will see a nice gate in the Dompropstei; in 1790, this gate was closed and covered, the entrance moved to the Kapitelgasse lane around the corner. Only in 1977, the original entrance was reconstructed again. The Erzbischöfliches Palais is the official residence of the Archbishop of Salzburg since the 19th century and can be found on Kapitelplatz 2, just next to the Dompropstei. It was built by linking two existing buildings in 1690. The architect in charge was Sebastian Stumpfegger, a famous local mason and builder that is buried at nearby Petersfriedhof Cemetery alongside with his seven wives (note also our article on funny stories from Salzburg). The central entrance carries the coat of arms of the little-known Archbishop Josef von Tarnoczy. The Kardinal-Schwarzenberg-Haus can be found on Kapitelplatz 3. It is the former Granarium, the corn and grain storage facility of the Prince Archbishop. It served in this function from at least 1569, was renovated in the late 17th century, equipped with a mill in 1775, as well as a bakery in 1800. In 1920, lots and lots of concrete transformed the building into a parking house, a new use that the building had until 1990. In 2006, it was transformed again, this time into a "storage facility of knowledge" as a reference to the grain storage for which it originally served. It contains the archives of the cathedral and facilities linked to the music of the cathedral – rehearsal rooms, a library of notations, archives and alike. The Dompfarramt or Dechanat dates back to at least 1521, but is probably based on older, Medieval buildings. It can be found on Kapitelplatz 7 and is home to the "facility management" of the cathedral – a function that can be tracked back at least to 1530. Turning rightwards to the monastery of Stift St. Peter, you will get to the abbey′s Mühlenhof. Here you can see a mill with a reconstructed wheel that utilises the Almkanal. Next to the mill you find the oldest bakery of Salzburg, which has been continuously operated in association with the monastery since 1150. You can enter the cemetery of St. Peter from here. The Festungsgasse lane offers access to the Fortress and passes the living house of Michael Hayden, composer and brother of a more famous Joseph Hayden; alternatively, you can go via the lane branching off at the Granarium (Kardinal Schwarzenberg Haus), which is a longer route, but a nice neighbourhood that sees very few tourists.